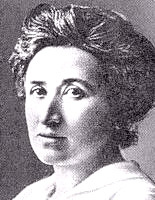 Rosa Luxemburg (March 5, 1871 – January 15, 1919, in Polish Róża Luksemburg) was a Polish revolutionary of Jewish ancestry. She rose up in an armed revolt to bring about a Communist revolution in Germany, but the revolt failed and she was killed. Luxemburg was a German Marxist political theorist, socialist philosopher, and revolutionary. She was a theorist of the Social Democratic Party of Germany, and later the Independent Social Democratic Party of Germany. She started the newspaper The Red Flag, and co-founded the Spartacist League (or Spartakusbund in German), a revolutionary group that became the Communist Party of Germany and took part in an unsuccessful revolution in Berlin in January 1919. The uprising was accompanied by Luxemburg's propaganda, and crushed by the remnants of the monarchist army and freelance militias collectively called the Freikorps. Luxemburg and hundreds of others were captured, tortured, and killed; Rosa Luxemburg and Karl Liebknecht attained great symbolic status amongst democratic socialists and some Marxists. Luxemburg wanted to improve the social and economic conditions of the working classes and opposed the unequal distribution of wealth that served to disempower the many and to privilege the few. She was committed to the realization of equal rights for all people. As a Marxist, she did not believe in a God whose ultimate will it is for all people to enjoy social and economic justice, yet her courage and her commitment can inspire and encourage others who share her vision of human unity. Rosa Luxemburg was born Rosalia Luxenburg on March 5, 1871, to a Jewish family in Zamość, near Lublin, in the then Russian-controlled Poland. Sources differ on the year of her birth—she gave her birth year as 1871 on her CV for Zürich University, but her 1887 Abitur (matriculation) certificate says she was 17. She was the fifth child of the Jewish wood trader/timber trader Eliasz Luxemburg III and his wife Line (maiden name Löwenstein). Rosa had a growth defect and was physically handicapped all her life. After her family moved to Warsaw, Rosa attended a girl's Gymnasium (school) there from 1880. Even in those early days she was a member of the "Proletariat," a left-wing Polish party, from 1886. The Proletariat had been founded in 1882, 20 years before the Russian workers' parties, and started off by organizing a general strike. As a result, four of its leaders were put to death and the party was broken up. Some of its members managed to meet in secret; Rosa joined one of these groups. In 1887 Rosa passed her Abitur (final examination) and graduated from secondary school. After fleeing to Switzerland from imminent detention in 1889, she attended Zürich University, along with other socialist figures such as Anatoli Lunacharsky and Leo Jogiches. Her studies included philosophy, history, politics, economics and mathematics simultaneously. Her specialized subjects were Staatswissenschaft (the science of forms of state), the Middle Ages and economic and stock exchange crises. In 1890, Bismarck's laws against social democracy were annulled and the Social Democratic Party of Germany (SPD) finally was able to gain seats in the Reichstag (Parliament). But despite the revolutionary rhetoric that brought them political power, the socialists, once in parliament, focused more and more on gaining further parliamentary rights and on material wealth. Rosa Luxemburg, on the contrary, stuck to her revolutionary Marxist principles. In 1893, along with Leo Jogiches and Julian Marchlewski (alias Julius Karski), she founded the newspaper Sprawa Robotnicza ("The Workers' Cause"), in opposition to the nationalist policies of the Polish Socialist Party. Luxemburg believed that an independent Poland could only come about through revolutions in Germany, Austria, and Russia. She maintained that the struggle should be against capitalism itself, and not for an independent Poland. Luxemburg denied the right of self-determination for nations as contrary to socialism, which eventually caused tensions with Vladimir Lenin. She, like Marx, saw the injustice of how people were treated at the time of the Industrial Revolution, and wanted to ensure workers were not treated as slaves. She co-founded the Social Democratic Party of the Kingdom of Poland (SDKP), later in 1893, which would later become the Socialist Democratic Party of the Kingdom of Poland and Lithuania (SDKPiL) by merging with Lithuania's social democratic organization. Rosa Luxemburg was probably the SDKP’s most famous member. Despite living in Germany for most of her adult life, Luxemburg was to remain the principal theoretician of the Polish Social Democrats, and led the party in partnership with Jogiches, its principal organizer. In 1898, Luxemburg obtained German citizenship through her marriage to Gustav Lübeck, and moved to Berlin. She became active in the left wing of the Social Democratic Party of Germany (SPD), where she sharply defined the border between her faction and the Revisionism Theory of Eduard Bernstein; her 1899 brochure entitled "Social reform or revolution?" was a direct attack on his ideas. Luxemburg's grasp of rhetoric soon made her a leading spokesperson for the party. Overall, she denounced the increasingly conformist parliamentary course of the SPD in the face of the increasingly obvious likelihood of war. Luxemburg insisted that the critical difference between capital and labor could only be countered if the proletariat took over power and revolutionary changes in the whole environment of production methods occurred. She wanted the Revisionists to leave the SPD. This did not take place, but at least Karl Kautsky's party leadership kept Marxism on the program, even if his main aim was to improve the number of seats the party held in the Reichstag. From 1900, Rosa Luxemburg voiced her opinions on current economic and social problems in various newspaper articles all over Europe. Her attacks on German militarism and imperialism became heftier as she foresaw the approach of war, and she tried to persuade the SPD to steer in the opposite direction. Luxemburg wanted to organize a general strike to rouse the workers into solidarity and prevent war, but the party leadership refused, and in 1910 she split off from Kautsky. Between 1904 and 1906 her work was interrupted by three prison terms for political activities. Nonetheless, Luxemburg kept up her political activities; in 1907 she took part in the Russian Social Democrats' Fifth Party Day in London, where she met Vladimir Lenin. At the Second International (Socialist) Congress, in Stuttgart, she suggested a resolution, which was accepted, that all European workers' parties should unite in their attempts to stop the war. At this time, Luxemburg began teaching Marxism and economics at the SPD party training center in Berlin. One of her students was the later leader of the SPD, the first president of the Weimar Republic, Friedrich Ebert. In 1912 her position as a representative of the SPD took Luxemburg to European Socialists congresses such as that in Paris. Along with the French socialist Jean Jaurès, she ensured that in case of war breaking out, the European workers' parties were committed to a general strike. When the crisis in the Balkans came to a head in 1914, war seemed even more inevitable and she organized demonstrations (e.g. in Frankfurt) calling for conscientious objection to military service and refusal to obey orders. Because of this, she was accused of "inciting to disobedience against the authorities' law and order" and sentenced to a year in prison. Her detention did not begin directly, however, so she was able to take part in a meeting of the Socialist Office in July. She was devastated to recognize there that the workers' parties' nationalism was stronger than their class consciousness. On July 28, World War I started when Austria-Hungary declared war against Serbia. On August 3, 1914, the German Empire declared war against Russia. The following day, the Reichstag unanimously agreed to finance the war with war bonds. All SPD representatives voted in favor of this bill and the party also agreed to a truce ("Burgfrieden") with the government, promising to refrain from any strikes during the war. For Luxemburg, this was a personal catastrophe that even led her to briefly contemplate suicide: Revisionism, which she had fought against since 1899, had triumphed—and war was on its way. Together with Karl Liebknecht and some others such as Clara Zetkin and Franz Erdmann Mehring, Luxemburg created the Internationale group on 5 August 1914. This became the Spartacist League on January 1, 1916. They produced a number of illegal pamphlets signed "Spartacus" after the Thracian gladiator who tried to free slaves from the Romans. Luxemburg herself took on the name "Junius" after Lucius Junius Brutus, who was said to have founded the Roman Republic. The group rejected the SPD's 'ceasefire' with the German government under Wilhelm II of Germany in the question of endorsing World War I, and fought against it vehemently, trying to lead back towards a general strike. As a result, as early as June 28, 1916, Luxemburg was sentenced to two and a half years' imprisonment, at almost the same time as Karl Liebknecht. During her stay in the penitentiary she was relocated twice, first to Poznań (Posen) and then to Wrocław (Breslau). During this time she wrote several articles using the name "Junius," which her friends smuggled out and published illegally. These included The Russian Revolution, which criticized the Bolsheviks on a number of scores, and presciently warned of the danger that a dictatorship would develop under Bolshevik rule (she nonetheless continued to call for a "dictatorship of the proletariat" on the Bolshevik model). It was in this context that she wrote the famous Freiheit ist immer die Freiheit des Andersdenkenden (“Freedom is always and exclusively freedom for the one who thinks differently”). Another publication, in June 1916, was entitled Die Krise der Sozialdemokratie (“The crisis of social democracy”). In 1917, when the United States joined the war, the Spartacist League affiliated to the Independent Social Democratic Party of Germany (USPD), another group of anti-war ex-SPD members, founded by Karl Kautsky. On November 9, 1918, the USPD was catapulted into power as rulers of the new republic alongside the SPD, after the abdication of the Kaiser. This followed an uprising (the German revolution) which had begun in Kiel on November 4, 1918, when forty thousand sailors and marines took over the port in protest at a proposed engagement with the British Navy despite the fact it was clear that the war had been lost. By November 8, workers' and soldiers' councils had seized most of western Germany, laying the foundations for the so-called Räterepublik ("Council Republic"), modeled on the system of Soviets seen in Russia in the revolutions of 1905 and 1917. Luxemburg was released from prison in Wrocław on November 8, and Liebknecht had also recently been freed and reorganized the Spartacus League. Together they now produced Die Rote Fahne (“the red flag”) newspaper. In one of the first articles she wrote, Luxemburg demanded an amnesty for all political prisoners and called for an end to capital punishment. However, the united front disintegrated in late December 1918 as the USPD left the coalition in protest at perceived SPD compromises with the (capitalist) status quo. On January 1, 1919, the Spartacus League, together with other socialist and communist groups (including the International Communists of Germany, IKD), created the Communist Party of Germany (KPD) on the initiative of Karl Liebknecht and Rosa Luxemburg. Luxemburg supported the KPD's involvement in the national constitutional assembly which ultimately was to found the Weimar Republic, but she was outvoted. In January a second revolutionary wave swept Germany. Luxemburg wrote leading articles in Die Rote Fahne and encouraged the rebels to occupy the editorial offices of the liberal press. In response, the Social Democratic leader, Friedrich Ebert, employed nationalist militia, the Freikorps, to suppress the uprising. Both Luxemburg and Liebknecht were captured in Berlin by the Freikorps on January 15, 1919, and killed on the same day. Luxemburg was battered to death with rifle butts and thrown into a nearby river, and Liebknecht was shot in the back of the head then deposited as an unknown body in a nearby mortuary. Hundreds of KPD members were similarly killed, and the councils were suppressed. Luxemburg's body washed up in July 1919 and was difficult to identify. Spontaneity is always mediated by organization, just as organization must be mediated by spontaneity. Nothing could be more wrong than to accuse Rosa Luxemburg of holding the idea of an abstract "spontaneism." She developed the Dialectic of Spontaneity and Organization under the influence of a wave of mass strikes in Europe, especially the Russian Revolution of 1905. Unlike the social democratic orthodoxy of the Second International, she did not regard organization as the product of scientific-theoretic insight into historical imperatives, but rather as the product of the struggles of the working classes. In an article published just before the October Revolution, Luxemburg characterized the Russian February Revolution of 1917 as a revolution of the proletariat, and said that the liberal bourgeois were pushed to movement by the display of proletarian power. The task of the Russian proletariat was now to end the imperialist world war in addition to struggling against the imperialist bourgeois. The imperialist world war made Russia ripe for a socialist revolution. Therefore, "…the German proletariat are also ... posed a question of honour, and a very fateful question" (245). Her sharp criticism of the October Revolution and the Bolsheviks was lessened insofar as she explained the errors of the revolution and of the Bolsheviks with the "complete failure of the international proletariat" (On the Russian Revolution GW 4, 334). Despite all the criticism, it remains to the Bolsheviks' credit that they dared to execute the revolution at all. The social revolution demands that power is in the hands of the masses, in the hands of the workers' and soldiers' councils. This is the program of the revolution. It is, however, a long way from soldier—from the "Guards of the Reaction" (Gendarmen der Reaktion)—to revolutionary proletarian. The task of the party is only to educate the backwards masses towards independence, Luxemburg believed—to enable them to take over power themselves. It is the teaching of the subjective element of the Revolution that is the consciousness of the working class of their historic mission, which the Party could achieve. The revolution itself could only be brought about through the working class. A Party that speaks for the workers, 'represents' them - for example in Parliaments - and acts instead of them, will get bogged down and itself become an instrument of the counterrevolution, according to Luxemburg’s view. I was, I am, I will be! "Only the working class, through its own activity, can make the word flesh." The East German government named Rosa-Luxemburg-Platz and its U-Bahn (subway) station on the U2 line in Berlin's city center district (Mitte) after her. The Volksbühne (People's Theatre) sits on Rosa-Luxemburg-Platz. The name has been left unchanged since reunification. Politische Schriften (Political Writings), edited and preface by Ossip K. Flechtheim, 3 volumes, Frankfurt am Main, 1966. Rosa Luxemburg Internet Archive at Marxists.org, a free library of her most important works. Biography (Study on Rosa Luxemburg ) by Tony Cliff, 1959, also at Marxists.org. This page was last modified on 19 July 2015, at 19:14.